Glass Bottles fall under the category of rigid packaging and as a form of container they have been around for centuries. Of course as the modern industrial age approached, higher demand for products necessitated the invention of ways to handle higher quantities of bottles at minimum cost. Packaging companies package products, and bottle companies make bottles. These are two distinctly different businesses with different methodologies, so it makes sense for them to exist separately. Once the bottles are made: They are cased and palletized for shipment to the packager. At the packaging company they are uncased and fed onto the packaging line. The first station to receive the bottles is usually a machine called the unscrambler/orienter. This machine makes sure all the bottles are right side up. Next comes the machine you see above. 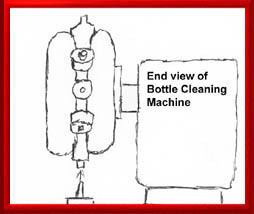 This machine inverts the bottle and then blasts the interior with a cleaning solution, which is then usually blown out with pressurized nitrogen. The bottle is reinverted and brought back up onto the packaging line for filling with product. The machine above does this by this by squeezing the bottles in between two pneumatic tubes. A drawing of how this works is in the slide show.